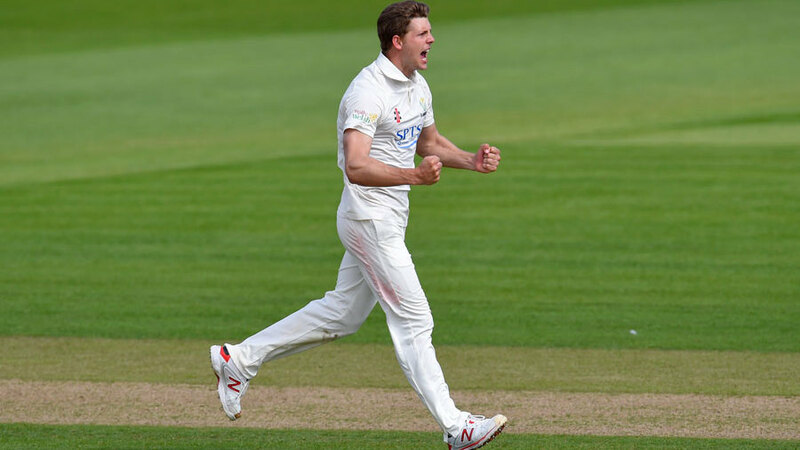 Glamorgan's bowlers made rapid inroads on an abbreviated second day's play in their Championship Division Two clash with Northamptonshire. Play was only possible before lunch at the Swalec Stadium but, after those 28 overs, the visitors were left struggling at 79 for 5. Even that came after a recovery of sorts, with Josh Cobb and Adam Rossington adding an unbroken 46 before rain stopped play. The weather threatened all morning and Glamorgan's seamers took full advantage of cloudy skies and a green pitch to trouble the batsmen. Resuming with no score after nightwatchman Azharullah played out a maiden on Sunday evening, he and Stephen Peters progressed to 28 before Northants collapsed to 33 for 5, with five wickets falling for five runs in six overs. The opening partnership featured five penalty runs, awarded when wicketkeeper Mark Wallace chased the ball to fine leg and returned to Colin Ingram, who had illegally put on Wallace's discarded glove to field the ball. Michael Hogan made the initial breakthrough when he uprooted Peters' off stump with a ball that nipped back off the pitch, and he was quickly followed by Kyle Coetzer who chipped Hogan to midwicket. There was no respite from the other Glamorgan seamers, with Craig Meschede inducing Azharullah to edge one to Jacques Rudolph at slip. Rob Newton became Meschede's second victim when he was caught by Wallace, before Rudolph then took his second catch in Ruaidhri Smith's first over to dismiss Rob Keogh. Northants could have been in further trouble had Ben Wright, at midwicket, managed to hold on to a sharp chance offered by Cobb before he had scored. Cobb and Rossington then counterattacked effectively, sharing eight boundaries in what remained of the action and leaving Northants 143 runs away from the follow-on target of 222.